Hematite stones are crushed and milled to a fine pigment to create a dramatic reddish brown watercolor with maximum granulation. 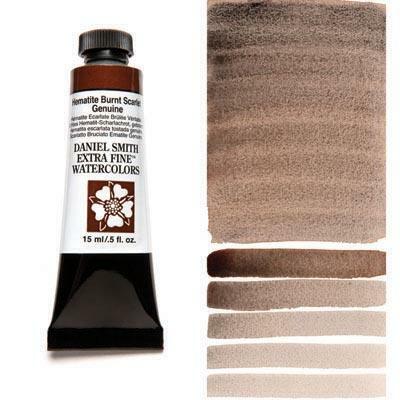 Add texture to your work with this genuine PrimaTek pigment. Perfect for rugged landscapes and the natural texture of wood, stones and brick. Hematite is ground from a heavy silvery-black mineral rich in iron. In a thick wash, the heavier particles settle, creating bold granulation. In a thin wash, it is a rich sienna. Hematite Burnt Scarlet mixes wonderfully with other colors both neutralizing the color and adding beautful granulation. Hematite or the traditional Greek name, Bloodstone – when you paint, you can almost feel the pounding of the battle drums as ancient warriors covered their bodies with Hematite in the belief that they would be protected from mortal wounds. According to lore and superstition, large surface deposits of Hematite mark the site of hard fought battles, where the blood of fallen soldiers flowed into the ground.